I’m back from Los Angeles and (mostly) recovered from jet lag…and I have news! 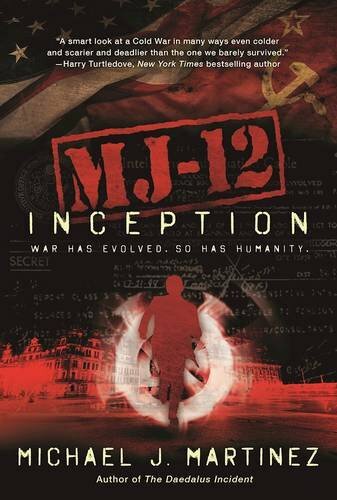 The official Goodreads giveaway for MJ-12: Inception is now live! Click here to enter! You must be a Goodreads member to enter, but it’s relatively quick and painless, I promise. We’re giving away ten freshly-printed hardcover copies, and you have until August 31 to sign up. And why should you enter? Well, besides reading this and possibly being predisposed to liking my work, MJ-12: Inception has been listed among of io9’s “All the New Scifi and Fantasy Books You Absolutely Must Read This Fall.” I mean, that’s practically an imperative, right? So excited to be on a list with so many fantastic authors. Check it out. If you don’t win the Goodreads thing, well, I hope you’re heading to DragonCon in Atlanta over Labor Day weekend, because that’s your next best bet. I’ll be there doing panels and readings and beer pairings (the latter by request only), and I’ll have a few copies to give away. There will also be limited quantities on sale in the vendor room, because we love DragonCon. There may yet be another giveaway before the book launches Sept. 6, but since it’s not live yet, I can’t announce it. But it’s also cool. Of course, if you can’t go to Atlanta and don’t want to leave things to chance, you can always pre-order MJ-12: Inception from Amazon, Barnes & Noble, Books-A-Million, Mysterious Galaxy, Borderlands Books, and/or through your local bookstore via Indie Bound. You can also order your Kindle, Nook, Kobo, Google Play and Apple iBook editions, too. Finally, if you’re in the San Francisco Bay area, I hope you’ll come out and celebrate with me at Borderlands Books on Tuesday, Sept. 6 at 6 p.m. I’ll be doing a reading and a talk and signing and all that good stuff. I may very well bring beer. Plus, you can support one of the best independent bookstores ever. Hope to see you there!